This is a kit version (assembly required) of the Small Iris card. The Small Iris card is the size of a standard business card 3.5" x 2". It functions as a mechanical iris similar to those used in photography aperture mechanisms. A tab on the card can be manually rotated to progressively open the hole in the center of the card up to a maximum size of one inch. The card varies in thickness, but is approximately .09" thick at its thickest point. See the video below for a demonstration of the card and assembly instructions. 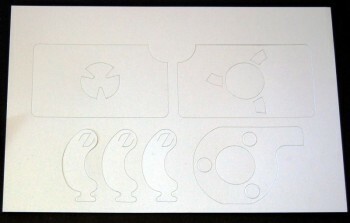 This listing is for the unassembled card kit; the assembled version can be found here. Printing note: I am not currently offering printing on the kit version of this card, but if you are interested let me know. I will consider it if there is enough interest. Please note that I would not be able to print across the center of the iris like I do with the assembled version. I would only be able to print on the pieces that form the main body of the card.